Thread: So, you thought you knew everything about Brake Pads? It is often said that brake pad manufacture involves more art than science, but this is generally not true. Are Aftermarket Brake Pads just as good as OEM? As with everything else in life, you get what you pay for, but in the case of Bendix brake pads, your customers pay for brake pads that meet, and often exceed OEM specifications in terms of durability, reliability, and smooth, silent operation. In fact, Bendix brake pads include several proprietary technologies such as their Blue Titanium Stripe that eliminates bedding-in, and Stealth Advanced Technology that ensures the optimum pad/rotor contact area to prevent overheating and brake fade in applicable applications. 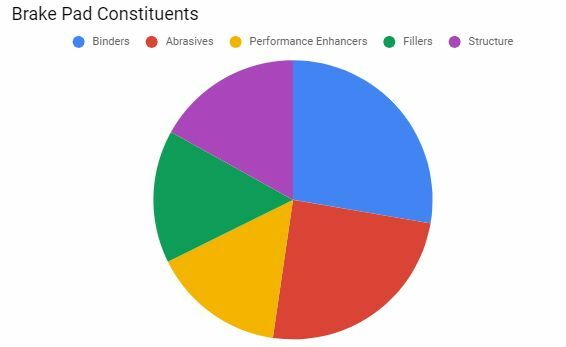 Given the above, it is fair to say that Bendix ranks high among the aftermarket brake pad manufactures that meet, and often exceed OEM brake pad performance levels on a consistent basis, so yes, aftermarket brake pads often outperform OEM brake pads, provided you fit Bendix brake pads to your customers’ vehicles. So, what goes into a Brake Pad? While brake pad manufacturers never publish the exact formulations of their brake friction materials, and are in many jurisdictions not obligated to, this article can only provide an overview of the materials that are most commonly used in brake pad manufacture. Consider the chart below. Pure carbon fibre is used as both an abrasive and a binder in mostly racing brake pads, although minute quantities of carbon fibre is present in some performance oriented aftermarket brake pads, with the price of the brake pads being a somewhat reliable indicator of how much, or how little carbon fibre is present in the pads. Ceramic materials occur in an enormous variety, and provided that any given brake pad contains actual ceramic material and not common clay, the ceramic component of the pad can fulfil any of the functions any of the other substances listed here, and in some cases, a brake pad can consist of nothing but highly refined ceramic. However, the problem with ceramics is that many brake pad manufactures define the word “ceramic” very loosely, with the result that many semi-metallic and even some organic brake pads are labelled as “ceramic” when in fact, there is no, or very little ceramic materials present in the pads. Kevlar in various forms is used in some specialised applications as a friction booster, but there is no verifiable information available regarding other possible uses. Note though that very few, if any brake pad formulations contain more than about 3% Kevlar. Which type of brake pad is the best? While there is no clear, unambiguous answer to this question, reputable brake pad manufacturers like Bendix produce brake pads for specific applications, each of which works better on the application it was designed for than on any other. However, there are five main categories of brake pads, and while choosing the best formulation within each category for a given application is not always easy, it helps to understand that there are few, if any purely metallic, ceramic, semi-metallic, or organic brake pads on the market anywhere in the world. Nonetheless, Bendix produces high quality brake pads in each of these main categories, but it must be understood that given the extensive list of requirements a particular friction material formulation must satisfy, it is common for brake pad manufacturers to mix and match the characteristics and ingredients of two or more categories of brake pads to obtain the best results in a particular application. In fact, it would be fair to say that brake pads should therefore really be marketed as “predominantly ceramic”, “mainly metallic”, “mostly semi-metallic”, or “largely organic”. 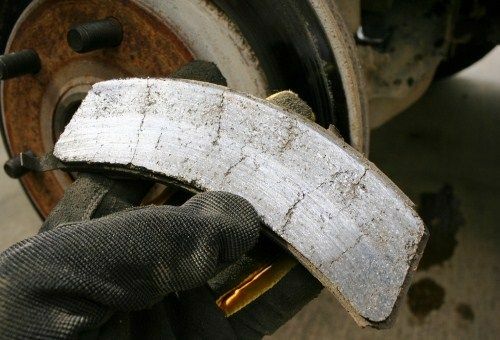 The disadvantage of metallic brake pads is that they are often not compatible with brake rotors on some high-end applications, which could result in severe brake noise and/or rapid wear of both pads and rotors. While semi-metallic brake pads typically do not outperform competing types in any particular area, these pads offer satisfactory performance in all areas, which makes them a great choice for variable driving conditions, with the exception of track racing or other motor sport applications. The disadvantages of organic pads include the facts that they are not particularly hardwearing, and that due to their composition they overheat easily, which destroys their ability to withstand brake fade. However, both pure ceramic and semi-metallic brake pads that contain significant amounts of ceramic are the most expensive categories of brake pads for all applications, which makes them unattractive options for customers on budgets. These are specialised brake pads in which the formulation of the friction material is designed to transfer some of the friction material to the rotor in the form of a thin film. In practice, these pads do not act on the rotating rotor directly; instead, the thin coating of friction material that was deposited onto the rotor forms a barrier between the pad surface and the rotor surface, but since the film and the pad consist of the same material, braking action is greatly increased. This characteristic makes this type of pad an excellent choice for drivers who do a lot of towing, or who participate in motor sports that place high, if not extreme demands on brake components. However, the biggest disadvantages of film transfer pads are that very specific bedding-in procedures must be followed and that very high brake temperatures are required for the transfer of friction material to take place. As a practical matter though, since the required temperatures are seldom, if ever reached during normal driving, film transfer brake pads are not recommended for normal street use. From the above, it should be obvious that there is no single “best” brake pad that will satisfy all the requirements of all applications under all possible operating conditions. Nonetheless, brake pads are life-and-limb components on any vehicle, and as such, it is incumbent on us as experienced technicians not only to learn as much about brake pads as we can, but also to be aware of both the characteristics and limitations of the various types of brake pads. Last edited by matespace; 01-11-2018 at 02:14 AM.